Each day that passes, the 243 tanneries at Hazaribagh discharge 7.7 million liters of untreated, highly toxic liquid wastes into the river Buriganga. 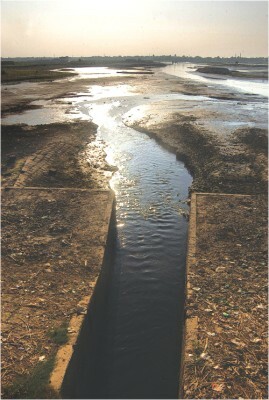 With the onset of the dry season every year the river becomes a mere sewerage where no aquatic life can survive. Although the Bangladesh Small and Cottage Industries Corporation (BSCIC) is working to set up a leather industrial estate in Savar since 2003, officials there now say it may take several years for the relocation of Hazaribagh tanneries. The Tk 1.7 billion project for relocation of the tanneries is now entangled in various complications. The tannery owners have refused to move until the government agrees to pay them Tk 8 billion, which is their estimated cost of transporting equipment and rebuilding at the new leather estate. The owners are also demanding a waver of their personal loan repayments, which adds up to about Tk 12 billion. Now the question remains how long can our lifeline sustain such onslaught. The photo was taken by our staff photographer Syed Zakir Hossain at around 3 pm on Friday at the Rayer Bazar sluice gate, the largest outlet of tannery liquid waste.